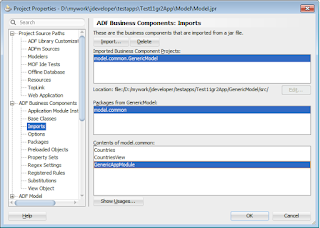 Right click the model project which consumes business components from other model projects in the same workspace and select Project Properties.In the Project Properties dialogue window, select the Dependencies tab and add the 'supplier' Project by either selecting Build Output option or Jar archive option . The above steps is enough to consume Java classes from the dependent model project. To consume business components follow Step 3. 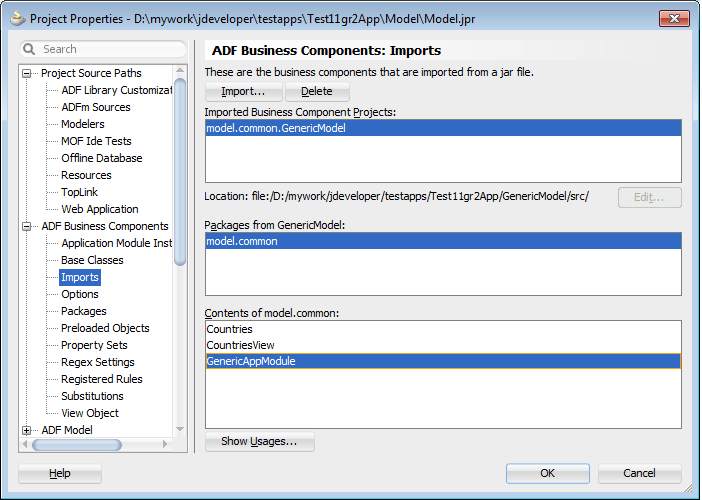 Once you define the dependencies for the consumer project, in the Project Properties window, select Imports option displayed below the ADF Business Component node. Click Import button, select the desired jpx file (jpx for the project whose business components needs to be imported to the consumer project) using file browser and then select the components that needs to be imported to the consumer project as shown in the following diagram. You are done with the import task. Now IDE will start exposing business components in the consumer project. Please note that, ADF development team is working on the 'dependency management' feature to make it more user friendly so that specifying dependency may be enough to consume business components from dependent project. Stay tuned, will keep you posted ! In step 1, what's the difference between and pros/cons of selecting either the "Build Output" option or the "JAR Archive" option? What are the deploy time ramifications for this ? I mean, How does a standalone WLS know of this dependency ? I also have the same question as Chris too. I like the idea of splitting model projects when the underlying data-model has several layers or I'm building on a large data model and I want to organize the code to smaller logical model projects within the work-space. Is that the primary use case here to do this? @Chris, I'm guessing the "build output" will be used when you test with the integrated WLS since you dont have to run a "deploy" to generate a jar. You'd probably never use it when deploying to a standalone WLS, since there is no build path there (You could explode the contents of a jar, but why would anyone want to do that:) ). The Jar option seems to be made for a standalone deployment, but like in my question above, I'm not sure how WLS understands this dependency. I have some external jar files in filesystem.I build a new project from ApplicationMenu New Project>Generic Project.jars are availble under new project. How i import the packages/classes under this project to my Model Layer project as i want to use classes from this project ?